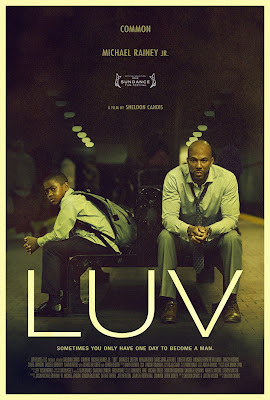 LUV is an earnest film with flashes of brilliance, but ultimately it stretches credulity too far to be taken seriously. Written by Justin Wilson and directed by Sheldon Candis (YOUNG CAESAR), it tells the tale of a young kid called Woody living with his uncle and grandmother in Baltimore. The opening scenes clash with every preconception we have from watching The Wire. His clothes for school are neatly laid out and he's getting a proper breakfast. But Woody's day takes a wrong turn when his Uncle - an ex-con ex-dealer trying to go straight - decides to take Woody under his wing and teach him about "real life". This, it turns out, encompasses a quick lesson in firing a gun and driving a car - clumsy foreshadowing anyone? Woody doesn't actually do much for half the film. He just watches his Uncle get drawn back into the game. They share some sweet moments but the relationship is always slippery and slightly sinister - and I love that delicacy of writing. The problem is in the second half of the film when Woody becomes a Mary Sue figure, and the finale is quite simply absurd. At the Sundance London screening, the director asked us to accept the film as a fable rather than as a realistic portrayal of events, but frankly there wasn't enough in the stylistic choices within the film to support this reading. On the positive side, the film contains strong performances from Common as the Uncle and Michael Rainey Jr as Woody. There are also some nice cameos from Dennis Haysbert, Danny Glover and the legendary Michael K Williams. The tech package, however, leaves something to be desired. A lot of the film takes place outside at night at the Red One's inability to capture true deep black is a problem. LUV played Sundance and Sundance London 2012. It opens in the USA on November 9th. AVENGERS ASSEMBLE - that ole Whedon magic!